Better than calling it “Bob.” Who would buy that? 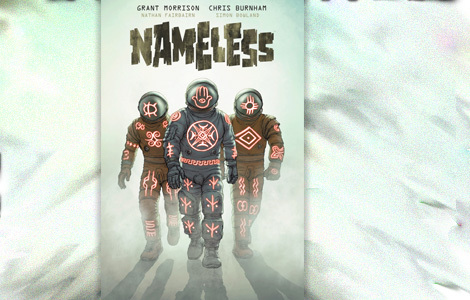 Nameless, by Grant Morrison is not a conventional comic book. It’s part horror, part psychological thriller, part mystery, part adventure, part a lot of things (not for kids, though). It’s confusing and weird and fascinating. I enjoyed it, but the reader needs keep an open mind. To start things off, we see that something strange is going on in the world, as several people are shown suddenly killing their entire families and writing strange words on the walls with their blood. Cut to our protagonist stealing an artifact from ancient ruins, then running through a swamp while being chased by some kind of fish people. This man is an expert in certain occult lore that’s about to come in really handy. Without giving too much away, the protagonist is rescued from his pursuers, but his rescuers have been looking for him. They need him to accompany them on a mission to space to stop a massive asteroid from crashing into Earth. But it’s no ordinary asteroid, and it may be directly related to the problems planet-side. That’s all the story I can really discuss. This comic book is dense: dense with imagery and symbolism, dense with information, dense with ideas. It’s overwhelming at times. And it jumps around, too, so keep you thinking cap on. This is serious philosophy and you need to be ready for it. I initially thought it was straightforward horror, but it’s not. It’s a deep meditation on the nature of the world. If that kind of mental challenge is your thing, Nameless may be for you. Unfortunately, the strengths of Nameless are also its flaws. That denseness, it’s like a master-class after you’ve already studied the subject for the last 4 school semesters. Except I haven’t studied this material for any semesters. The author has a lot to say about religion and spirituality from a perspective I’ve never encountered before. That’s fine by itself – it’s the main reason I found the story so interesting. But the author has so much knowledge he wants to impart, on subjects I’m willing to bet many readers don’t know much about, that he leaves you bewildered. For proof, after the story, there is a section detailing the meaning of each chapter, names of places and people, and the significance of all the imagery. If you need an essay to explain your story, you may have overdone it. On the other hand, it does open up the story to the point where you may find yourself re-reading it with your newfound information. Whether you agree with the author’s point of view is another matter. If you have that open mind, though, I think you’ll be fascinated by the story, even if you disagree with the author’s conclusions. If he could have just streamlined that story a little more, to the point where it didn’t seem do disjointed on the first read, it would have been pretty epic. But Nameless is still interesting. I liked the author’s moxie in trying to pull all this together. Since this is a comic book, I have to talk about the artwork. It’s a stand-alone story, so there is one artist throughout, which is always nice. The work of artist Chris Burnham and colorist Nathan Fairbairn is perfectly paired with this story. The art is detailed, expressive, and appropriately horrific. It really interprets the meat of the story on each page. I think someone had a good time drawing this thing. I had a good time reading it. But I think I deserve a participation trophy for making it through.